Who Should Read Hidden Champions of the 21st Century: Senior managers and executives of companies who are growing, and/or wanting to scale-up. Hidden Champions of the 21st Century are medium sized companies with revenue under $4 billion. Hermann Simon spent 20 years studying around 2,000 companies worldwide from different industries. Each dominates one of the top three positions in their market globally. Most have low-level public awareness. Two-thirds are from the German-language area. One-third are over a century old. One company, Gallaghers, is from Hamilton, New Zealand. 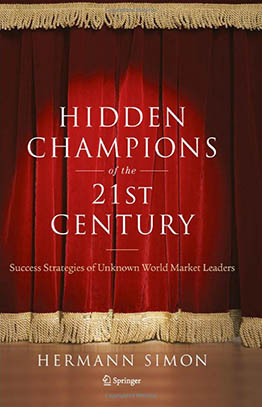 Hidden Champions of the 21st Century shares commonalities and lessons learned from all the companies in the study. These common themes form part of their company culture and help them to consistently get it right – all the time. This book has been written from a research project. It is worth persevering through the first 40 – 50 pages, however, as you will then find it easier to understand what to do – and what not to do when building your own business.